JOIN POCI/RENEW Why Join POCI? What you see here is a dream, a project, that I wanted to see become a reality since the early 1980’s. Many of us saw cars created back then in the “pro-street” theme, I was one of those teenagers. 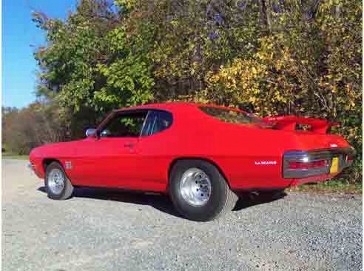 When I was 16, I knew specifically which car I wanted to build this way: A 1971 Pontiac LeMans. My grandmother purchased a new LeMans on August 13th, 1971 from Steene-Miller Pontiac in Oak Hill, WV. Total price was $3,450. I have had the car since 1980, driving it for three years with the original Pontiac 350 and TH350 transmission. I was very smart in college, buying “clunkers” to drive so that I could keep the LeMans in our basement and away from the West Virginia winters. In 1983, things changed again with the car as I lost my mom to cancer. In the summer of 1983, I removed a 455 and TH400 from her 1972 Bonneville. After having the engine “warmed up”, it was placed in my LeMans. The car was driven in summer months only until the fall of 1987. The car stayed in many garages over the years, awaiting a transformation. This process began in early 2015. This “transformation” began by having a Checkered Racing four-link rear suspension (with sway bar), roll cage, wheel tubs, fuel cell and narrowed 9 inch Ford rear end installed by Front Page Motorsports of Roanoke, VA. Now, my work began as I proceeded to re-wire the whole car with a Painless kit, install a new fuel system, new interior, Dakota Digital gauges and fan controller, disk brakes on all four wheels, CPP hydro-boost and tubular A-arms, a BeCool fan and radiator package, Vintage Air a/c system, MechMan alternator and many other modifications. 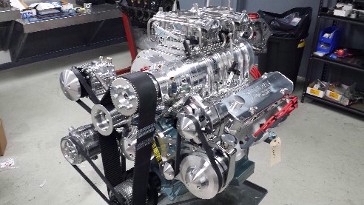 The 455 engine block, from my mother’s car, was sent to Butler Performance Pontiac as I wanted them to tackle the largest aspect of the build. 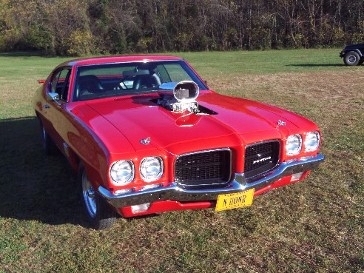 Since the 1980’s, I had always envisioned a blower sticking up through the hood of my car…. 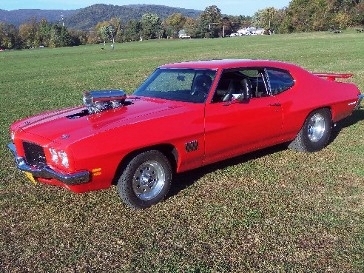 Butler utilized a BDS 8-71 blower (with dual chrome Holley 650’s by BDS), Edelbrock round port aluminum heads, a custom March serpentine belt system, Comp roller cam / lifters, MSD ignition and the list goes on. I requested a “mild” build, and the 711HP and 697lb-ft of torque provides just that – yes, with the a/c on! I received EXACTLY what I wanted. The TH400 from my mother’s car was built by Bass Transmissions of Roanoke, equipped with a manual valve body and stronger internals. I then installed a Pro-Torque converter and a Gear Vendors overdrive, and both of them are performing very well. So, do you care to guess what was the most emotional part of the build was? You have many things to consider that relate to this 18+ month project. When the car came home from paint, the very first thing I did was to install my license plate: N HONR. The car was “in honor” of my mother, my grandmother, my father, all of our family members that had something in common with this vehicle. On September 3rd, 2016, I was finally able to drive the car with my wife by side. This was the first time for us in the car in 29 years! The next morning, we received a call at 4:30AM. My wife, who had been on dialysis since December of 2015, had to report to a transplant center immediately for a new kidney. This was one blessing after another. I have to say “thanks” to quite a few people that helped so much. The following have helped make this dream a reality: Butler Performance Pontiac, J. D. Campbell, George Page, Gary Stultz, Mark Patsel and especially my wife – Sherry Brown.